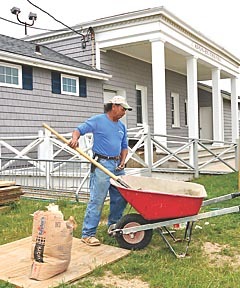 Avon prepares its municipal pool building for the upcoming summer season. Coaster photo. On Tuesday, Joanne Letson was planting canna flowers and palms at the “Bradley Beach sign” on the oceanfront. Earlier, she had planted marigolds and begonias in the area. Soon, the B-R-A-D-L-E-Y B-E-A-C-H lettering sitting in the flower bed would be getting a coat of white paint. In-season is upon us: Memorial Day Weekend. “Start of summer, Opening Day,” said Rick Wlazlowski, 19, a Wall resident who was surfing earlier this week at Avon. Ah, bennies, Guidos, shoobies, WEBs: non-Shore people converging on the Shore. Hey, they are here already. Nicole Fleck, 19, of Wood-Ridge, Essex County, was sunning in her bikini earlier this week on the oceanfront at Bradley Beach. As a day-tripper, Fleck says “I try to come two times a week” to the beach. And Fleck put another perspective on Memorial Day Weekend. “To me, it’s an honor,” said John Zech, 66, speaking of being the grand marshal of Saturday’s Bradley Beach Memorial Day Parade. Zech is an Army veteran of the Vietnam War era. “I’m with a group of fine guys from World War II, Korea, Vietnam,” Zech said. “(Memorial Day’s) a recognition of all the people who have served (in the military). My personal thing, it’s for all the vets,” living or deceased. Zech has been in every Bradley Beach Memorial Day Parade, either as a member of the First Aid Squad or Fire Department, since moving to the borough in 1976. Letson will also be marching in the parade. “I love the parade; I’m part of the Fire Department,” she said. As for the beginning of summer season, Bianca Bertoli, 20, was sitting on a bench under the sun in Asbury Park, outside of Hot Mess hair salon, where she does hair. Is Bertoli a beach girl? “Yes, I am, every chance I get,” said Bertoli, a Matawan resident who normally visits the Asbury Park and Sea Bright beaches. As for Memorial Day Weekend, Bertoli likes “a good barbeque,” although she had no specific plans as of Tuesday. While Bertoli said “there’s a good vibe on Memorial Day Weekend,” she does not view it as a kickoff of summer for herself. At least some have a practical view of the Shore summer vibrancy. Mish benefits from the summer season: He is an Avon lifeguard. Siroky checks off something else on the calendar when Memorial Day Weekend arrives — “You can finally start wearing white pants,” he said. A student at William Paterson University, Fleck is free of school over the summer and manages part-time jobs to get in beach time. “Nothing interferes with my beach time,” Fleck said. Or to September’s Labor Day, the unofficial close to the Shore summer season. Were we not just talking about the every-other-day-of-snow and the everyday-of-very-cold-temperatures?